Molded composite foam rollers are perfect for positioning, balance, postural and much more! The round rollers offer progressive exercise sequences which allow the user to graduate to larger and more difficult composite foam rollers. The molded ends of these foam rollers do not degrade with use. These foam rollers are available in 36″, 18″ and 12″ lengths with either a round (circular) or half-round (semi-circular) profile. Premium EVA foam rollers are perfect for positioning, balance, postural and muscle re-education, spinal stabilization, body awareness and coordination, and ranging and strengthening activities. The EVA rollers are made of extra firm foam, yet they are soft to touch. They are strong enough to be used by large adults and active children. 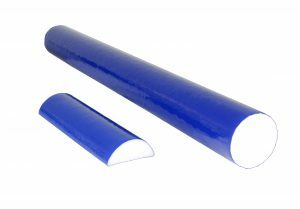 These foam rollers are available in 36″ and 12″ lengths with either a round (circular) or half-round (semi-circular) profile. Polyethylene foam rollers with TufCoat finish are perfect for positioning, balance, postural and muscle re-education, spinal stabilization, body awareness and coordination, and ranging and strengthening activities. The TufCoat finish is a solid plastic-like coating layer on the exterior of the white foam roller that adds a level of firmness and wash ability. To check out our line of foam rollers, click here.